The Hellfire Caves (also known as the West Wycombe Caves) are a network of man-made chalk and flint caverns which extend a quarter of a mile (250 metres) underground. They are situated above the village of West Wycombe, at the southern edge of the Chiltern Hills near High Wycombe in Buckinghamshire, Southeast England. They were excavated between 1748 and 1752 for Francis Dashwood, 11th Baron le Despencer (2nd Baronet), founder of the Dilettanti Society and co-founder of the Hellfire Club, whose meetings were held in the caves. The caves have been operating as a tourist attraction since 1951. The caves run into the hillside above West Wycombe village and directly beneath St Lawrence's Church and Mausoleum (which were also constructed by Sir Francis Dashwood around the same time the caves were excavated). West Wycombe Park, ancestral seat of the Dashwood family and also a National Trust property, lies directly across the valley. The caves' striking entrance, designed as the façade of a mock gothic church and built from flint and chalk mortar, which was erected in around 1752, can be viewed directly from West Wycombe House. 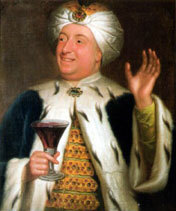 The unusual design of the caves was much inspired by Sir Francis Dashwood's visits to Italy, Greece, Turkey, Syria and other areas of the Ottoman Empire during his Grand Tour. The caves extend a quarter of a mile (250 metres) underground, with the individual caves or "chambers" connected by a series of long, narrow tunnels and passageways. A route through the underground chambers proceeds, from the Entrance Hall, to the Steward's Chamber and Whitehead's Cave, through Lord Sandwich's Circle (named after John Montagu, 4th Earl of Sandwich), Franklin's Cave (named after Benjamin Franklin, a friend of Dashwood who visited West Wycombe), the Banqueting Hall (allegedly the largest man-made chalk cavern in the world), the Triangle, to the Miner's Cave; and finally, across a subterranean river named the Styx, lies the final cave, the Inner Temple, where the meetings of the Hellfire Club were held, and which is said to lie 300 feet (90 metres) directly beneath the church on top of West Wycombe hill. In Greek mythology, the River Styx separated the mortal world from Hades, and the subterranean position of the Inner Temple directly beneath St Lawrence's Church was supposed to signify Heaven and Hell. A chalk mine of supposedly ancient origin is believed to have existed above West Wycombe for centuries. During the late 1740s, to try to combat local poverty, Sir Francis Dashwood commissioned an ambitious project to supply chalk for a straight three mile (5 km) road between West Wycombe and High Wycombe (then on the busy London-Oxford road, now the A40). Local farm workers, impoverished by a succession of droughts and failed harvests, were employed at one shilling per day (enough to sustain a family in the Georgian era) to tunnel beneath ground and mine chalk and flint. The chalk was used to build the West Wycombe-High Wycombe road and also houses in the village and the church and Mausoleum. Considering they were all dug by hand, the caves are often regarded as an incredible feat of engineering. The caves were used as a meeting place for Sir Francis Dashwood's notorious Hellfire Club, whose members included various politically and socially important 18th-century figures such as William Hogarth, John Wilkes, Thomas Potter and John Montagu, 4th Earl of Sandwich. Though not believed to have been a member, Benjamin Franklin was a close friend of Dashwood who visited the caves on more than one occasion. The Hellfire Club had previously used Medmenham Abbey, eight miles (13 km) from West Wycombe on the River Thames, as a meeting place, but the caves at West Wycombe were used for meetings in the 1750s and early 1760s. At the time, Sir Francis' club was not known as the Hellfire Club - this name was given much later. His club used other names, such as The Brotherhood of St. Francis of Wycombe, Order of Knights of West Wycombe, and The Order of the Friars of St. Francis of West Wycombe. According to Horace Walpole, the members' "practice was rigorously pagan: Bacchus and Venus were the deities to whom they almost publicly sacrificed; and the nymphs and the hogsheads that were laid in against the festivals of this new church, sufficiently informed the neighbourhood of the complexion of those hermits." Dashwood's garden at West Wycombe contained numerous statues and shrines to different gods; Daphne and Flora, Priapus and the previously mentioned Venus and Dionysus. Meetings occurred twice a month, with an AGM lasting a week or more in June or September. Many rumours of black magic, satanic rituals and orgies were in circulation during the life of the club. Dashwood's club meetings often included mock rituals, pornographic materials, much drinking, wenching and banqueting. The early 1760s saw the downfall of Dashwood's exclusive club, and the Hellfire Club had been dissolved by 1766. After the demise of the Hellfire Club and Sir Francis Dashwood's death in 1781, the caves were disused from 1780 to the late 1940s, and fell into disrepair. During World War II, plans were made to use the caves as a large air-raid shelter if nearby towns were bombed, but Buckinghamshire's rural position meant that High Wycombe and surrounding towns were not an enemy target, and so the plans were not carried out. During the late 1940s and early 1950s the caves were renovated and turned into a local visitor attraction by the late Sir Francis Dashwood (11th Baronet), who used the profit earned to refurbish the dilapidated West Wycombe Park. West Wycombe Caves have had more than two million visitors since they reopened in 1951. Wikimedia Commons has media related to Hellfire Caves, West Wycombe. This page was last edited on 18 November 2018, at 11:45 (UTC).